Interest in solar energy is on a high. The Honourable Prime Minister of India himself spearheads the country's commitment to clean energy. In his address at the World Development Summit in New Delhi in February 2018, he referred to the ISA (International Solar Alliance) as the single most important global achievement after the Paris accord on Climate Change. The target of the national Solar Mission has been raised and set at 100 GW generation by the year 2022. Although scientific research in solar energy has not been intense, India does have a few firsts to its credit. The Cochin International airport in Kerala is the first and only airport in the world to be run completely by solar power. It has received the United Nations' highest recognition for environment, the 'Champions of the Earth Award' for 2018, under the "Entrepreneurial Vision" category. The Indian Railways has taken initiatives to harness renewable power through solar roof panels, to run the electrical appliances on the trains, thereby reducing fuel costs and contributing to a cleaner environment. We are witnessing a major transformation in the transport sector on land. The tipping point for large scale adoption of electric vehicles is around the corner. It is no longer a question of "if", but a question of "when". Experts differ only on the year of this large scale shift - anywhere from 2022 to 2030. A similar transformation is awaiting the shipping industry. Ten years ago, a large RORO vessel, Auriga Leader, was launched by NYK Shipping. This ship used solar power to reduce the generator load for lighting. A few years back PlanetSolar, the largest solar boat in the world, circumnavigated the globe. India's first solar powered passenger ferry, Aditya, has been operating successfully for the past 20 months in the backwaters of Kerala. Based on its success, the Kerala Government has ordered three more solar ferries of 75 to 100 passenger capacity. Other States like Goa, West Bengal, Maharashtra, UP, and Telangana have similar plans. The IWAI (Inland Waterways Authority of India) has launched pilot e-solar passenger boats along the Ganga at Varanasi. Students from Kashmir have developed a prototype of a 2-seater boat that can ferry tourists on the Dal lake in Srinagar. Solar power can find larger application in leisure and small passenger boats, fishing vessels, small harbour tugs and pilot boats, and coastal barges. It can be extended to sea-going ferries in inter-island transport in Andamans, and in Lakshadweep. There are about 2 lakh small boats that are engaged in fishing on the coast and inland waters. The government presently offers subsidies for purchase of the boat, and for petrol outboard motor (OBM) in the initial stage, and also provides annual fuel subsidy for the operation of the boats. The operational costs of solar powered vessels have proven to be negligible in comparison to those powered by traditional fuel. Financial viability studies ought to compare life cycle costs of the boats -diesel versus solar power. As an incentive, comparable subsidy can be offered for CAPEX of solar ships. Environmental cost benefit analysis will strongly favour the solar powered boats. Choices need to be made regarding the appropriate category of vessel that can run on solar or solar hybrid energy, and the relative benefits of new built solar ships vis-a-vis conversion of existing ships to solar power. The option of solar photovoltaic versus solar thermal power also needs to be assessed for the chosen category of vessels. The R&D wing of the IRS (Indian Register of Ships), a member of the International Association of Classification Societies, has been given the task by the Directorate of Shipping to study the technical feasibility and financial viability of solar powered and hybrid water transport vessels. Regulatory incentives and focus on solar research have ensured that cost of solar power generation has plummeted over the last decade. 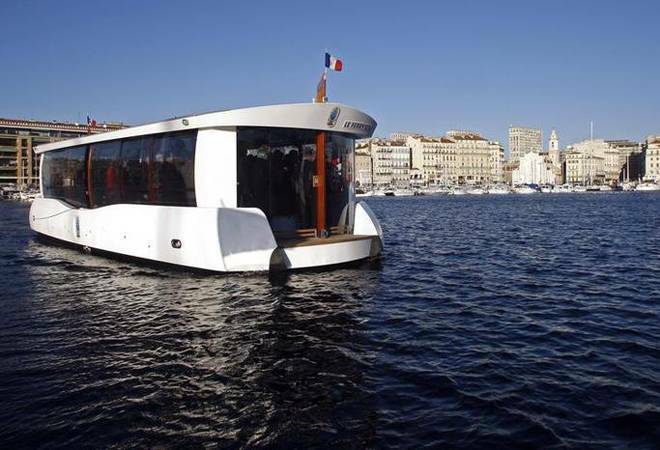 With environmental issues tending to take centre stage, solar powered boats will have immense potential in eco-tourism in places such as Dal Lake in Kashmir, Sunderbans sanctuary in West Bengal, Chilika lake in Orissa. Currently, vessels plying near the coast, including fishing vessels, are a source of both water and air pollution, and this has a deleterious effect on health and environment of the coastal population. While the International Maritime Organization regulates marine pollution through international conventions such as MARPOL, we need to find practical solutions to counter the ill effects of fossil fuel propelled ships nearer our habitations. With a long coastline and ample source of solar energy, the time is ripe to propel solar powered coastal and fishing boats. Solar energy tariff has become competitive; there has been tremendous improvement in battery storage capacities. With the right financial model and incentives, solarisation of ships can be a viable alternative.